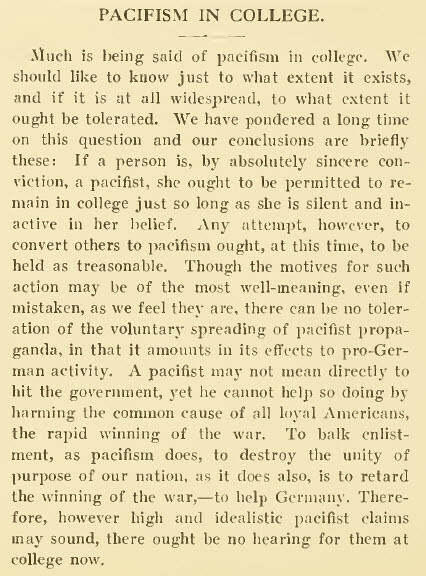 Given that colleges of the last fifty years have been seen as homes of resistance towards war movements, it's interesting to see this college newspaper advocate towards silence with regards to those who hold pacifist leanings. The line that sticks out "If a person is, by absolutely sincere conviction, a pacifist, she out to be permitted to remain in college just so long as she is silent and inactive in her belief." Much like the later Red Scares, McCarthyism, and the Post-9/11 PATRIOT Act seeing the press join in on the silence of freedom of expression is always scary and disheartening within the United States.